"A little nonsense now and then is relished by the best of men." 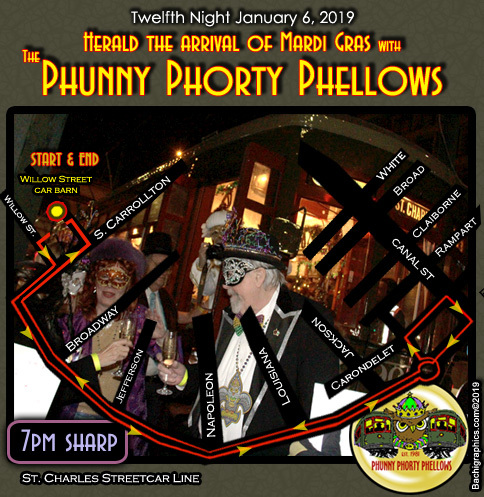 Celebrating the arrival of the Carnival Season, the costumed and masked krewe of the Phunny Phorty Phellows assembled on Twelfth Night, January 6, 2019 (Sunday) at the Willow Street Car Barn (map) at 6:30pm. 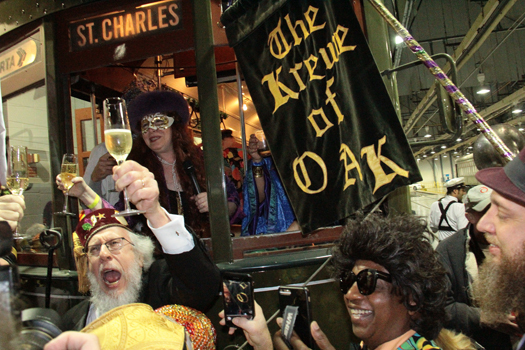 At 7pm sharp, the Phunny Phorty Phellows boarded the streetcar and began their ride to "Herarld the Arrival of Carnival" down the St. Charles Ave. Streetcar Line. All were invited to come see the PPP off beginning at 6:30, when the group started to gather. Of course Storyville Stompers were there with us. The Phellows are an historic Mardi Gras organization that first took to the streets 1878 through 1898. They were known for their satirical parades and today¹s krewe members’ costumes often reflect topical themes. The group was revived in 1981.